Getting started in importing or exporting has never been easier. The internet has made finding and communicating with global suppliers and customers almost as easy as doing business with the person down the street. But succeeding in international trade is as hard as ever. There are a myriad of import and export trade regulations that you need to follow on every international transaction, and the penalties for non-compliance—fines, restrictions on importing or exporting, and even jail time—keep getting larger. Fortunately, Shipping Solutions' International Trade Compliance Wizards make it affordable for you to meet these responsibilities quickly and professionally. If your company is like most companies, the biggest challenge to implementing proper export controls is finding an easy way to integrate them into your export process. If your export staff can’t easily check a customer against the Restricted Party lists, for example, it may not get done. That’s especially true if the export compliance process substantially delays the shipping process. That’s why Shipping Solutions has created a variety of trade compliance software tools that make the compliance process as easy as visiting a website. And because your export compliance needs may differ from what other companies need, we’ve made our menu of tools à la carte, so you can subscribe to only those services you actually need. Government export regulations, including the Commerce Department's Export Administration Regulations (EAR), the State Department's International Traffic in Arms Regulations (ITAR), and Office of Foreign Asset Controls (OFAC), prohibit trade with specific individuals, companies, institutions and organizations. Instead of publishing all these names of denied parties in a single list, each government department and agency with jurisdiction over exports publishes their own list, which means there are dozens of lists to check! By using our Restricted Party Screening Wizard, you can check all the U.S. lists—as well as the United Nations list, European Union list, and lists from several other countries—at one time and in just seconds. Before you export your goods to another country, you need to determine whether or not you must first get an export license based on your product classification under ITAR's U.S. Munitions List (USML) or EAR's Commerce Control List (CCL), and the destination country. The Export Controls Wizard tells you if your product requires an export license and if there are any potential license exceptions you can use. Our Product Classification Wizard makes it easier for you and your company to identify your products' correct Schedule B or Harmonized System (HS) numbers that are required on your export documents and import paperwork. This tool also searches the Export Administration Regulations (EAR) and the International Traffic in Arms Regulations (ITAR) to see if the government identifies your product as a controlled item, and then helps you determine the proper Export Control Classification Number (ECCN) or the U.S. Munitions List (USML) category required for export license determination. As an importer, the burden for properly classifying your goods and determining the correct duty rate and other fees falls squarely on your shoulders. And while you may be relying on a broker to help you clear your goods, you and your company are ultimately responsible for the accuracy of the information. In addition, international sourcing and purchasing decisions need to be based on complete cost information including duty and tax rates in order to accurately compare sourcing options. Our trade compliance software tools make it easier for you to properly classify your goods and determine complete import costs. The U.S. government's import regulations may impose import quotas or import license or certificate requirements on certain goods. Our Import Controls Wizard identifies any import controls that may exist for your products and/or the countries from which they are originating and provides information concerning the support documentation needed to receive an import license or other control documents. Before you can accurately determine the best country to source a product, you need to know the final cost of delivering that product to your warehouse or other destination including all import duties, taxes and other government charges. In addition to providing that detail, our Landed Cost Calculator will also warn you if anti-dumping duties or countervailing duties may apply for a specific product. Our Calculator even allows you to simultaneously compare products imported from up to four different countries so you can quickly compare costs. Our Product Classification Wizard makes it easier for you and your company to identify your products' proper Harmonized System (HS) numbers that are required for clearing your goods through customs when you import and must appear on your paperwork when you export. With subscriptions starting at only $1,200 a year, Shipping Solutions trade compliance software Wizards are the affordable way to remain compliant with international trade regulations. Subscribe to one or more of our Trade Compliance Wizards now, and you’ll be up and running with the service right away. 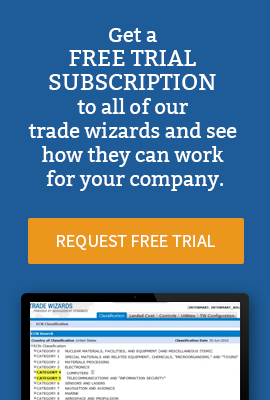 If you’re not yet ready to subscribe, you can try out the Trade Compliance Wizards for free by completing the trial request form or calling us toll-free at (888) 890-7447. We’ll show you how easy export and import compliance can be! who utilize the Trade Wizards to stay compliant with export and import regulations.